Editor's note: Shortly after we published this piece, Hudl acquired its main competitor, Digital Sports Video, for an undisclosed amount. Read more here. WHAT: Web-based video editing, analyzing and sharing for non-techie athletic coaches from the high school level through professional. Coaches can also share data reports and presentations with players, plus make their highlights public. 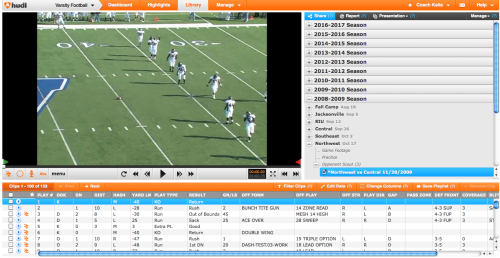 Hudl is targeted at football and basketball teams but works for most any sport where coaches use video to improve performance and/or study competition. Cost for high schools starts at $800 a year. Hudl has apps for iPhone and iPad, Android app in development. LAUNCHERS: David Graff (CEO), John Wirtz (COO) and Brian Kaiser (CTO), classmates at the University of Nebraska's Raikes School of Computer Science and Management. WHY: It’s inefficient for coaches to print playbooks and burn DVDs for every game. Pricey software packages require certain hardware and/or charge license fees for each machine, and they’re not easy to use. High school football coaches can spend hours driving to a meeting point to exchange game DVDs with their upcoming opponent. BACKSTORY: While working for the University of Nebraska’s head football coach, David saw how much time and paper was wasted prepping players. The founders put together a rough prototype in spring 2006 then showed it to the coaches, who wanted it for practices that were less than a month away. The founders then explained it would take, umm, a little more time/work to build out what they demo’d. No surprise: the University of Nebraska was Hudl’s first paying customer. WHEN/WHERE: 1.0 in June 2007, 4.0 in June 2011 / Lincoln, Nebraska. COMPETITION: Digital Sports Video, Dartfish, CoachComm, CompuSports, Siliconcoach (based in New Zealand). CUSTOMERS/GROWTH: Initially focused on the NFL and Division I universities. Began selling to high schools in summer 2008 because of market interest. Had 350 high schools by August 2009 and over 2K by the end of 2010. Currently at 3K, on track to have over 5K schools by the end of 2011. NFL teams using Hudl include the New York Jets, the Cleveland Browns and the Denver Broncos, and Division I teams include USC, Michigan and Penn State. WHAT A COACH USING HUDL THINKS: Tim McFadden is the defensive coordinator at Denison High School in Texas, north of Dallas. He previously coached at the University of Nebraska and knows Hudl from its early days. He loves how easy it is to get video in the hands of his players. “They’ve done a good job understanding that coaches are there to coach. If it’s not going to be good for students and easily implemented, they’re not going to use it,” says Tim. PHILOSOPHY: “Our mission literally is to help coaches win. That’s the three words we rally around here. The next layer behind that is ‘save coaches time,’” says John. ON BEING A STARTUP IN NEBRASKA: Big advantanges are lower cost of living and "hard-working staff that just has Midwest and Nebraska values," says John. Disadvantage: "You have to be original about the way you find [developer] talent." WHO BACKED IT: Primary investor is Jeff Raikes, former Microsoft exec, now head of the Bill & Melinda Gates Foundation and namesake of the businesss school the founders attended. Raikes grew up in Nebraska and loves Husker football. Other investors are prominent business leaders in Lincoln and Omaha. TOTAL RAISED: About $3.5M. $60K from winning business plan competitions essentially the seed round. $1M in Series A (summer 2007) and $2.5M in Series B (early 2009). John says Hudl gets two to three calls from VCs every week, but the company is not looking to raise right now. NUMBER OF EMPLOYEES: 40, 16 of them in customer support. One developer and one salesperson telecommute from Austin. Logging in brings you to your dashboard page, where you see recent items team members have shared with you. Click on the “Library” tab to see videos organized by season. Open a season, choose a game, and then select whether you want to see game footage, practice or video of that opponent. If the coach has broken a video down into clips and added data for those sections, you will see these in the box below the video window. Play any clip from the navigation box. 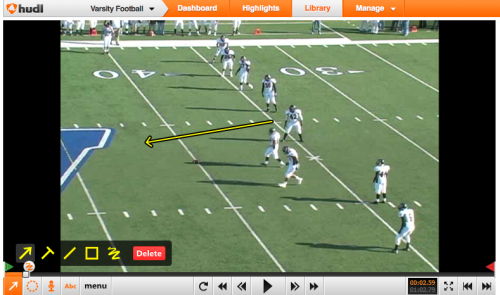 Annotate videos with a set of tools in the lower-left corner. You can record a note, paste a note, or draw lines, arrows or circles on the video. You choose which members of your team to share the video with -- with or without your notes.